Hamby Home(in)stead ...: Re-couping the coop costs! If the chookies were still here, we could have celebrated the first anniversary of the new girls' arrival. 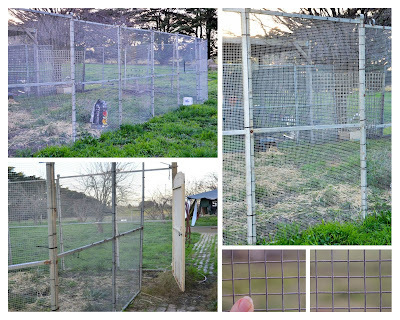 Instead, their Fox-proof Fowl Fort (FpFF) sold tonight on eBay - for $105 less than we paid for it more than two years ago. We're pretty pleased with that outcome. Given other fencing costs, we spent a bit over $200 all up on the FpFF during the time we/the chookies used it. That's $200 for more than two years of feathered friend fun. On a rough calculation the expense reduces to something like 25 cents a day, which is even cheaper than Erin's van/house extension! It's almost 11 weeks since we received the Notice to Vacate - and a little over a month before our final exit date. We've achieved so much in that time and are justifiably chuffed with our efforts. Our current tally stands at 35 boxes of donations versus 48 packed and stacked to come with us. More items have been given away via various FaceBook Buy, Sell, Swap pages - and quite a lot of rubbish has been culled also. We've generated heaps of recycling, though some paperwork was far too sensitive for the bin. I've burned what seemed like several reams of horrid history. It's hard to describe how light I felt as I watched the paper curl in the flames. I expected to feel good but was unprepared for how free I felt. I was smiling for hours afterward!